The Jetsetters, after settling for a 1-all drawing with neighbours Lautoka in the first round, came from behind to thrash newcomers Dreketi 5-1 in the first today. Much to the delight of Dreketi fans, Peni Sokia opened the account for the newcomers in the 4th minute of play to enjoy a 1-0 lead early in the first half. However, the Green Machine opened the flood-gates in the 25th minute via a penalty kick from Samuela Drudru after the Dreketi defense handled Napolioni Qasevakatini’s corner kick in the box. And it was all over to Nadi from there. Ame Votoniu struck twice while Drudru added his second goal to the score-sheet before Mohammed Shafin placed the final nail into Dreketi’s coffin. The Lambert Sarju-coached Lautoka side also bounced back to winning ways in style after they defeated defending champions Suva 2-0 during round 2 battle-of-the-cities encounter. Suva, following a 2-2 surprise draw against the newcomers, failed to find the net with the numerous goal scoring opportunities. Jone Vono Jnr gave the Blues a 1-0 lead at half time before he broke the hearts of the Capital City boys with his second goal in the 90th minute, securing the maximum points after two rounds of matches. Neighbours Nadi and Lautoka have four points in bag, however the Jetsetters lead group A with a better goal difference (plus four to Nadi and plus two to Lautoka. Both teams need just a draw to secure a semi-final spot each. Suva and Dreketi share a point each and both need a minimum of four clear goals during the round three games to qualify for the knockout stages. 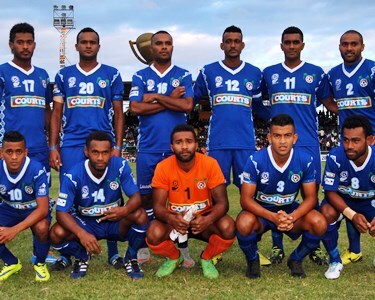 Lautoka plays Dreketi at 1.30pm tomorrow while national league winners Nadi battles reigning champions Suva at 5.30pm. Meanwhile in the senior division, Taveuni held Nasinu to a 1-all draw before defeating Bua 3-1 while Lami edged Bua 1-0 before settling to a 2-2 draw against Northland.